I’ve got some catching up to do. I’ve got several finished pieces to show you, but I shall talk about just two for now, and my trip to Stitching for Pleasure. 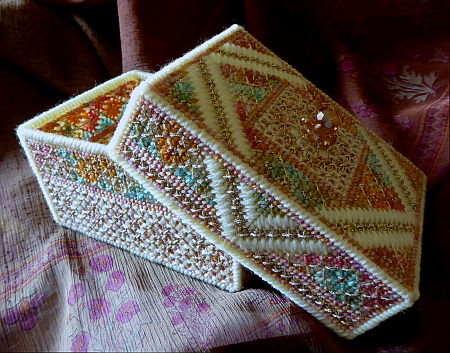 This is the stitched box I started a while back (here’s the first post I made on its progress). It took almost forever – all that metallic thread, very hard on the fingers! The last stitch went in just at the end of February. I call this one “Empress of Mars”. Here’s a close up of the lid, to show off the texture and the central decoration. 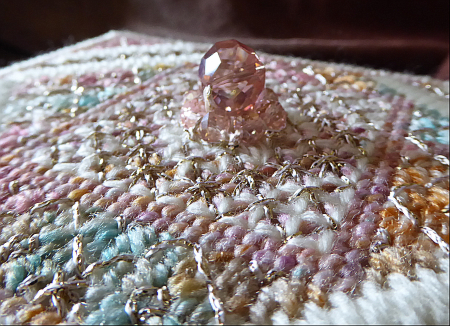 The pink cut-glass beads came from an old necklace. I attached them with strong thread, before hiding that with metallic thread on top. On Friday, I went to Stitching For Pleasure at the NEC, once again meeting up with Rachel from Virtuosew Adventures, for a natter and a look around the stalls and the exhibitions. Rachel’s superb piece “Leaving the Tyne” was on show in the Embroiderers’ Guild display of their “100 Hearts”. I was pleased to see it was one of three given pride of place right at the front entrance. On my wants list this year were some more colours of Gütermann Sulky Cotton 12 – which I found on the Barnyarns stand, Some Stef Francis Superfine silk thread from the Silk Mill stand, a couple of fat quarters from Bombay Stores, and some offcuts of evenweave from Fabric Flair which I think was on the Yorkshire Book Company stand. I was remarkably restrained and didn’t buy anything not on my list, this year, despite temptation. Although I did come home with a portable, rechargeable LED lamp. I was only intending to look at the different models this visit, but i made my mind up quite easily. I’ll talk about that on another post, as I haven’t yet tried it out properly. 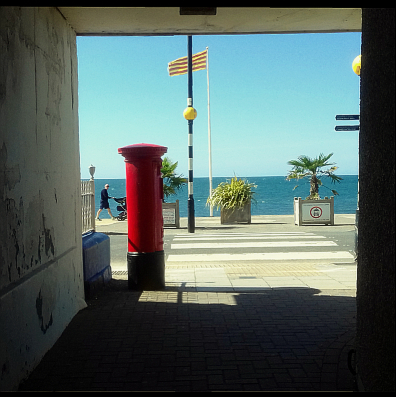 All in all, a very successful and enjoyable day out, but very tiring. There’s nothing like a day spent looking at supplies and lovely finished pieces to get the old fingers itching to try things out. 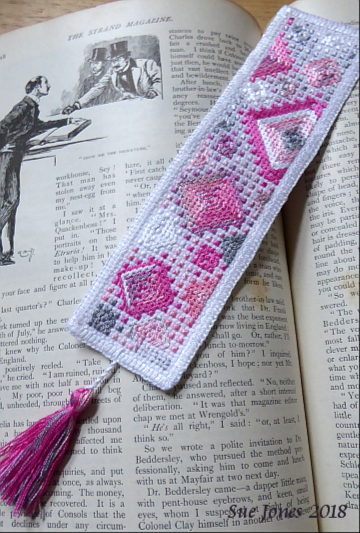 Needless to say, I ended up spending much of this weekend making yet another bookmark. This one is on a piece of 28 count cotton evenweave from my Fabric Flair purchases at the NEC. It’s printed with pale blue random ‘clouds’ and is stitched with one strand of a slightly darker blue stranded cotton (two strands for the buttonhole stitch edging). Stitches used include double cross, tiny eyelets, a big spider eyelet and something like a double leviathan stitch. I’m quite pleased with this one. I think it’s made something quite delicate out of a somewhat unprepossessing piece of fabric. 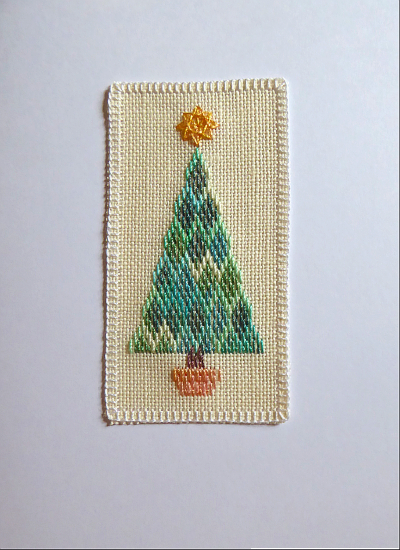 Here’s another interlaced stitch for you to try – you might find it handy for Christmas decorations and cards. The original sampler was charted by Permin of Copenhagen – it’s a massive chart on two huge sheets of paper. 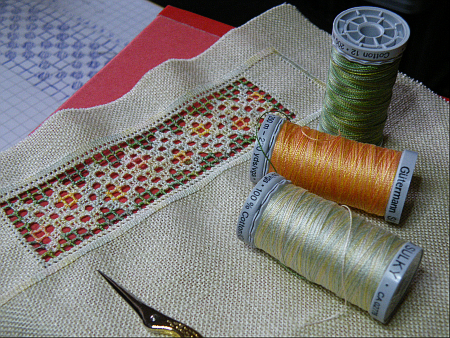 Worked over two threads on 30 count fabric, the size of the whole sampler would be 61 x 57 cm! Their reference number for the kit version is 39-8406 “Sampler ‘Antique'”. (Stocked in the UK by Sew and Sew, if you fancy such a mammoth undertaking.) 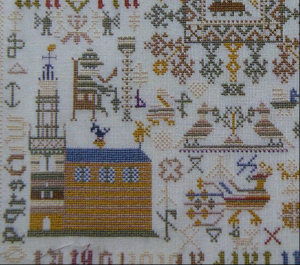 Back in 1663, it was stitched by 11 year old Annetje Muusdochter, who lived in Broek in Waterland, near Amsterdam. I can’t do better than point you at this blog page from Ex Antiques, who specialise in old samplers and have researched the Broek samplers – sixteen surviving examples known so far. They have a picture of the original. Not the clearest of photos, but close enough to show that the Permin chart is very accurate. 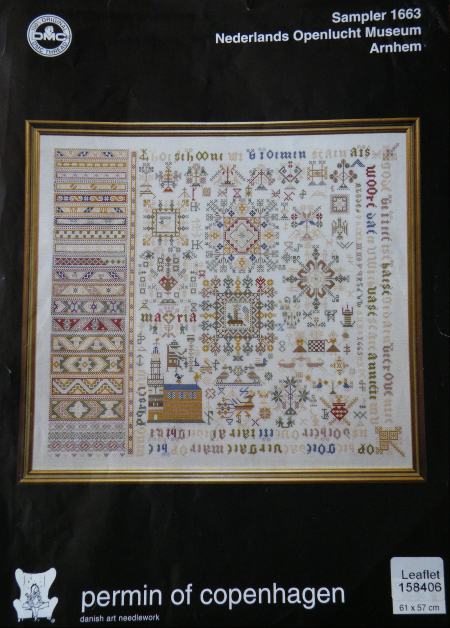 The Ex Antiques blog is a treasure trove if you are interested in old samplers, particularly Dutch samplers. There are other posts about the Broek samplers, and photos of many of them. When I saw the sampler, two things caught my eye. 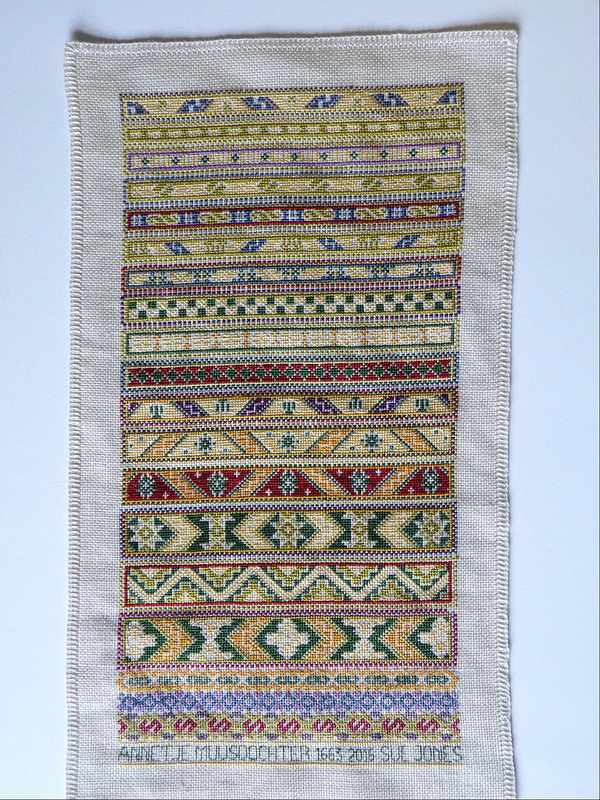 The first thing was the long strip of voided patterns on the left of the sampler: oh, how I wanted to work those bands! (More about the practicalities of working them in a mom ent.) I definitely wasn’t interested in producing a copy of the whole sampler, although one or two of the motifs might be quite fun to adapt, and the lettering style is quaint, if not particularly easy to read. The other thing that caught my eye was the curious way Annetje had filled the gaps between the motifs and patterns – little shapes and signs made of straight lines. What were they? Some sort of code? I’ve chosen this project as a way of explaining the coloured, counted openwork I have been working on recently, based on the examples in this old book from the Internet Archive. This is my own ‘take’ on the stitching, and is not necessarily the way it was originally done. 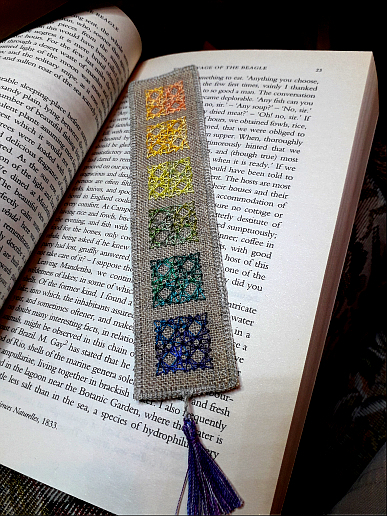 I am splitting the bookmark project into two posts. This one covers the materials and tools, and explains marking out, edging and cutting the threads to make an area of mesh. 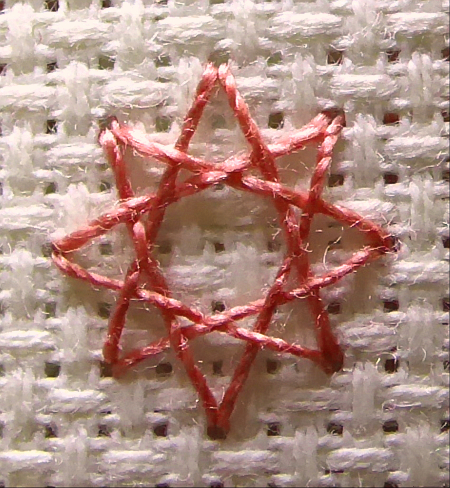 (The same technique works for similar types of embroidery on mesh, so it’s worth learning.) 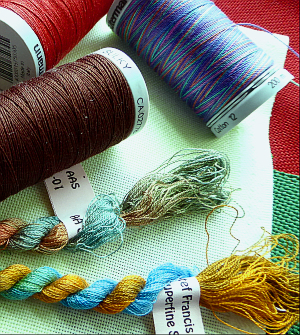 In the next post on this project we’ll do the fun bit – filling the grid with stitches.